Developed from the question Can a chair be made from a multitude of the same components? In a (failed) attempt to simplify the manufacturing process involved in making an armchair, the Monroe Chair is an exploration of form and function through repetition. 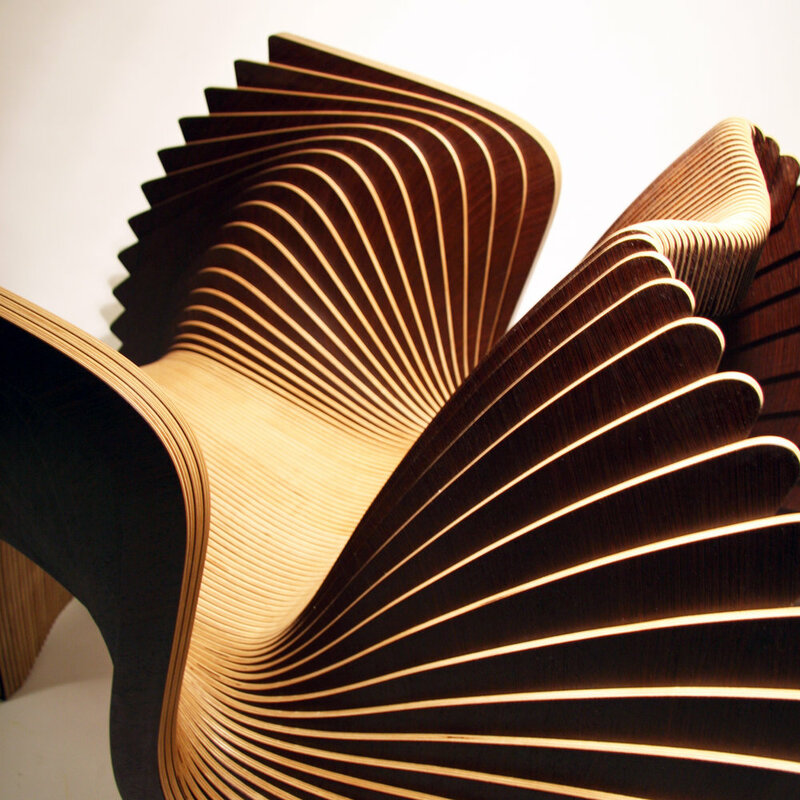 It uses eighty-three identically shaped CNC-produced components that are assembled rotating around a central axis, creating a complexly curved, beautiful, and comfortable armchair. The challenge was to create one flat shape that contains all five of the main elements of an armchair, as the back leg gradually morphs into the backrest and the armrest into the seat and front leg. This creates a distinct aesthetic entirely defined by the simplicity of the initial idea. It is named Monroe after its striking resemblance to Marilyn Monroe’s white pleated dress as she steps over a subway grate in New York City. This particular chair was made especially for the Wood, Revisited exhibition at the Center for Art in Wood and is one of a kind. 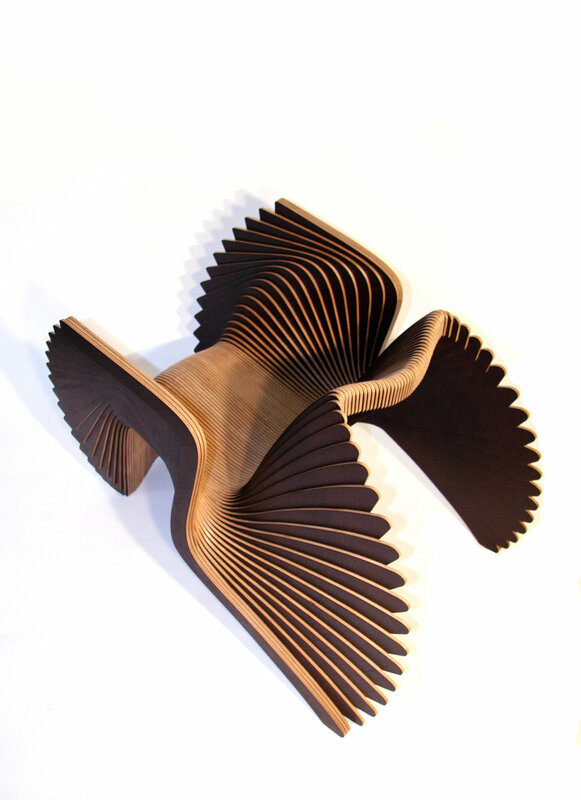 Entirely made of wood, this chair is composed of carefully handpicked maple and wenge constructional veneer glued to either side of birch plywood sheets. These are then cut using CNC technology to create the eighty-three identically shaped components, each having unique dowel holes that help locate one component in relation to the next. The chair is then assembled, dowelled, and glued by hand before being hand finished. The artist chose both a light and a dark wood to add a layer to the complexity of this piece while at the same time referencing the dual life of the icon it is named after. Simplicity, transparency, and quality are the key foundations of White's work. His understanding of traditional crafts and modern manufacturing technologies, combined with good design, give to his work a unique aesthetic that does not engage with trends or fashion. Born in London in 1987, Alexander White was brought up and schooled in the southwest of France from the age of three. He returned to the UK in 2006 to study 3-D design at Falmouth University in Cornwall, graduating in 2010. After this he spent two years in Wiltshire, England, under the mentorship of furniture artist Fred Baier. During this time he continued to make his own work, developing an unconventional and playful approach to design. After leaving Baier in 2012, White gained further experience working with designer Paul Cocksedge in London before starting his own eponymous studio in 2013. From here he concentrates on creating idea- and process-driven products and furniture of exceptional quality. His current portfolio includes artworks and high-end bespoke pieces as well as public and commercial projects. He has gained recognition from the A’ Design Award (2012); Homes and Gardens Designer Awards: Young Designer (2014); Heal’s Discovers (2015); and Design Guild Mark (2016).